Spring is here and that means one thing – it’s time to plan your 2019 Margaritaville at the Park tour. Escape to Margaritaville with live pregame music, a special ticket package that includes co-branded Margaritaville sunglasses and more when the Tampa Bay Rays take on the Boston Red Sox. Arrive early for a Ryne Stanek Bottle Opener gate giveaway, while supplies last. To order 10 or more tickets contact Tom Egan at 727-825-3425 or tegan@raysbaseball.com. Braves! Parrotheads, beach lovers, and baseball fans can enjoy Jimmy Buffett tunes at a FINtastic pre-game concert by The Boat Drunks. With the purchase of a special Theme Ticket, you will receive a Margaritaville-inspired all-over print shirt. A portion of each ticket sold will be donated to Singing for Change. 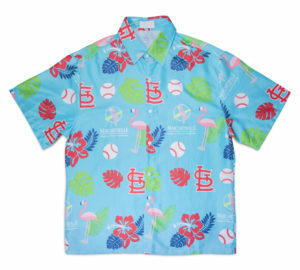 Change your latitude and float on down to Busch Stadium for Margaritaville Night. After all, it’s 5 o’Clock (or 7:15) somewhere! Pro Tip: Stop by Margaritaville Lake Resort, Lake of the Ozarks for the weekend after the game. A 2.5 hour drive from St. Louis, the refreshed property will feature renovated guestrooms, an exterior refresh and several new dining concepts. The Padres and Margaritaville invite you to take in the lifestyle and sounds inspired by Jimmy Buffett, for an island-style Party in the Park presented by Southwest Airlines. 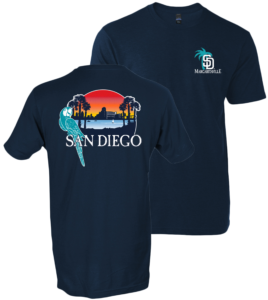 Your Margaritaville Theme Game Package includes a limited-edition Margaritaville-themed Padres t-shirt and a ticket to the Nationals vs. Padres game. A live band will play pre-game on the stage at Park at the Park. The Giants are excited to bring back Margaritaville Night to AT&T Park! Your Special Event ticket package includes a ticket to the Friday night game versus the Los Angeles Dodgers, admission to the pre-game Margaritaville event in Seals Plaza from 5:00-7:00pm, as well as a collector’s edition Margaritaville/Giants T-Shirt! Be sure to come join us along the Portwalk in Seals Plaza where you can feel like the “Son of a Son of a Sailor” during what should truly be a FINtastic time at the ballpark! Save the date – more to come soon! It’s always 5 o’Clock somewhere, so come early and enjoy a pregame concert at Texas Live! Discounted tickets purchased through this link will receive a custom Margaritaville/Texas Rangers cap. Supplies are limited so get your tickets today. For additional information or groups of 10 or more tickets, contact Stephen Cothran scothran@texasrangers.com. Pro Tip: Can’t wait for the game? Get your tickets to the Margaritaville-inspired Park Place Dealerships Texas Rangers Triple Play Spectacular. Triple Play serves as the major annual fundraiser for the Texas Rangers Baseball Foundation. Triple Play is held every May, featuring Texas Rangers players competing in a series of games on-stage. In addition to the night’s entertainment, the evening includes both a live and silent auction with unique Rangers opportunities, exciting getaways and autographed memorabilia from across the sporting world and Hollywood. Change your latitude and escape to Margaritaville at Target Field! Join your fellow beach lovers and baseball fans for a night of fun at the ballpark on Friday, July 5th when the Twins take on the Texas Rangers at 7:10 p.m. 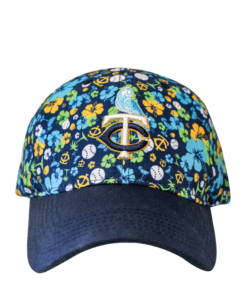 This special “Margaritaville Night” ticket package includes your ticket to the game plus an exclusive Margaritaville-inspired Twins baseball cap! Pro Tip: Avoid parking and driving downtown. Mall of America, and Margaritaville, is a short Light Rail ride away from Target Field. Join the Reds on July 19 for Margaritaville Night at the ballpark! In celebration of the 30th Anniversary of Off to See the Lizard this special package includes an exclusive Lizard bobblehead and your ticket to the game. Plus, enjoy a fireworks show after the game set to a Margaritaville soundtrack. Pro Tip: Start the party a day early and catch Jimmy and the Coral Reefer Band live at Riverbend Music Center. Calling all Parrot Heads and Pirates! Included with the purchase of your ticket is a Margaritaville-themed White Sox Dri-fit MLB Red Sox Margaritaville Towel-crop t-shirt. T-shirt vouchers are limited to the first 1,250 tickets purchased. Pro Tip: Get in the Margaritaville state of mind before gates open at Margaritaville on Navy Pier. Calling all Parrots to the Park! Enjoy summertime at Fenway Park with Margaritaville Night at Fenway on Thursday, August 1. This special night will include a pre-game concert on Jersey St. by The Island Castaways Band and a limited-edition Margaritaville Red Sox towel to use at the beach! 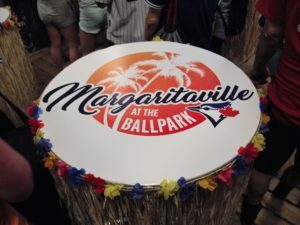 Margaritaville is back at Rogers Centre on Friday, Aug. 16. Join us in the 200 level WestJet Flight Deck for live music and entertainment where it will be 5 o’Clock somewhere all night long! The first 15,000 fans to enter the stadium will receive a Blue Jays & Margaritaville Est. 1977 Hat Giveaway. Keep checking back for more MLB games, like the Nationals, Marlins and Phillies, and find our full Minor League schedule below.